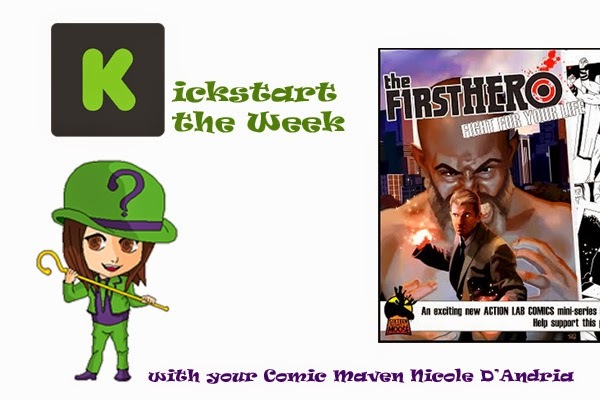 On this Monday’s “Kickstart the Week” I’m showcasing the Kickstarter for the comic book series The F1rst Hero: Fight for Your Life. This is a follow-up series to the Action Lab Entertainment mini-series, The F1rst Hero: The Monster. The F1rst Hero: Fight for You Life will be written by Anthony Ruttgaizer and illustrated by Danny Zabbal. The letters and coloring are being done by Fred C. Stresing. The mini-series is about Jake Roth, the sole superhuman in the world who has not gone insane from his powers. Those who have gone over the edge are known as “extrahumans” and they are hunted down by the government. In this mini-series, Jake discovers a mafia-controlled fight club whose champion is Odinson (based on Raymond Rowe, a star of the professional wrestling organization known as Ring of Honor), a three-armed extrahuman who enjoys killing his opponents in the ring to appease his audience. The sequel series to The F1rst Hero: The Monster will be published by the same company, Action Lab Entertainment. The creative team need to have at least 5,000 CAD (Canadian dollars) pledged to publish the project by April 17, 2015 at 11:59 pm EDT. You can pledge money on their Kickstarter. The comic book will debut under Action Lab Entertainment. I also spoke with the writer of the series, Anthony Ruttgaizer, about The F1rst Hero. Me: Why did you decide to fund the project using Kickstarter? 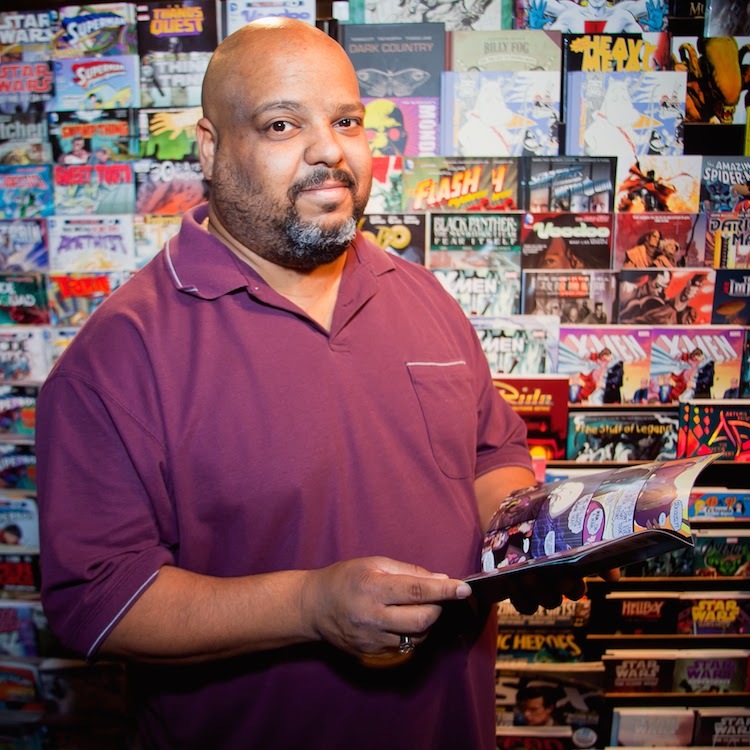 Anthony Ruttgaizer: Creator-owned comics, especially for a guy still in his first year in the industry, have very slim profit margins. From a purely business standpoint, it doesn't make sense to do the book if it will put me in a financial hole. 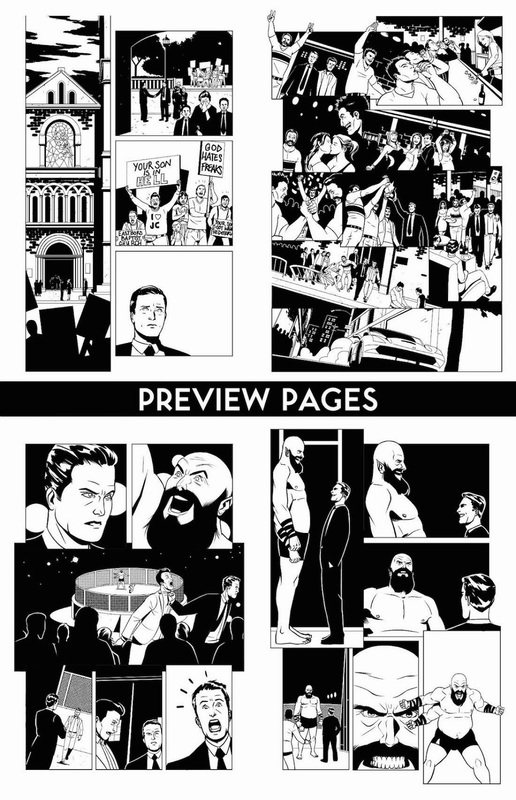 By utilizing crowdfunding websites (the campaign for Volume 1 was done through IndieGoGo.com), I can hopefully cover expenses like colouring, lettering and some publicity work without crippling myself financially. Me: How did you go about finding your publisher, Action Lab Entertainment? Ruttgaizer: I did a lot of googling and wiki'ing of North American publishers to find their submission guidelines and research what types of books they already published. Action Lab was on that list and when their creative director Dave Dwonch responded to my submission package, it didn't take long to decide that Action Lab was the right place for me to get my career started. Me: How would you describe the artwork in this mini-series? Ruttgaizer: Danny Zabbal has taken over the art chores for Volume 2 and his work is a bit of a departure from the amazing things Phillip Sevy accomplished in Volume 1. Danny's art is very clean, very precise. Maybe I'm wrong, but I see shades of David Mazzuchelli (Batman: Year One) in Danny's art. We certainly went that way with the colouring and Fred Stresing has hit that aspect of the art out of the park. Me: Can you talk about what the first series, The F1rst Hero: The Monster was about and how it was received by fans? Ruttgaizer: Volume 1 is an origin story. Our hero, Jake Roth, finds out that he has "extrahuman" powers but where everyone who has ever manifested powers before him has gone insane and been declared a threat to society, Jake keeps his mind. He must then decide what to do with his powers: use them to help people but put himself at risk of being hunted down or try to keep them a secret but watch innocent people be hurt around him every day. Me: What inspired the concept of having the character Jake Roth be the only sane superhuman? Ruttgaizer: I had already created the concept of insanity as a side effect for superpowers and the series was going to star Paul Kirkson and the ETF (Extrahuman Task Force) as the heroes fighting a variety of whacked out villains. But then I hit upon the idea for a much more unique character. An exception to the insanity rule. And along came Jake Roth. Me: Why did you decide to continue Jake Roth’s story in a new mini-series? Ruttgaizer: As I said, The Monster was just the origin story, so this has always been the plan. There are currently six volumes plotted out to tell the first of three "mega-story arcs" in Jake's life. Once we hit chapter 25 (The Monster was Chapters 1-4. Fight For Your Life will be Chapters 5-8.) I will see where I am business-wise and decide if and how to proceed with Chapter 26 and beyond. Me: How would you describe Jake? Ruttgaizer: He's a do-gooder. He just wants to do what he sees as the right thing even if that's the hard thing. He's the kind of guy who runs TOWARDS the danger to see how he can help. Me: What can you tell me about the villain of the mini-series, Odinson? 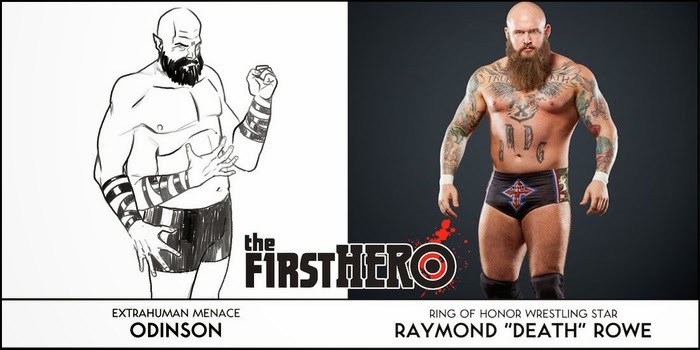 Why did you decide to base him off of pro wrestler Raymond Rowe? Ruttgaizer: Odinson is a three-armed, extrahuman badass. He's a homicidal lunatic who is the feature attraction in an underground MMA circuit being run by the Philadelphia mafia. I've known Ray for over a decade, since his earliest days in professional wrestling. His first trainer was one of my best friends in the business, Lou Marconi, and when Lou sent him to work for my promotion, the Union of Independent Professional Wrestlers, it was hard not to fall in love with the guy's talent, even that early on. Plus he is just a really great guy. Ray and I have remained good friends all these years and it just kind of popped into my head after talking to him one day that he'd be a great starting point for an extrahuman character. If you don't know about Ray, go to YouTube and look for him. Between Ring Of Honor and his indy circuit stuff, you're going to see an honest-to-goodness monster at work. Me: What other comic related projects have you worked on? 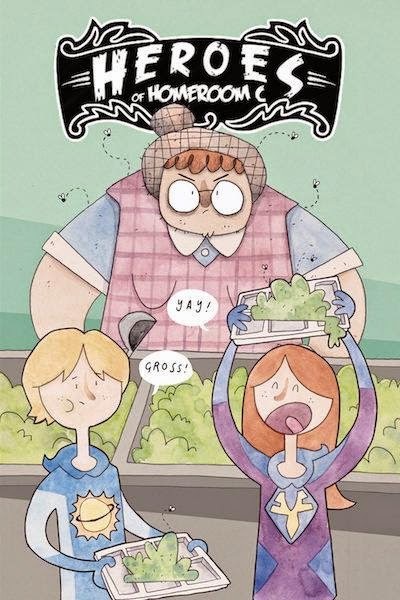 Ruttgaizer: I have a webcomic called Heroes of Homeroom C that I'm doing with artist Carlos Granda. It's about two 12 year old superheroes who lose their powers and have to go back to public school. You can find that at www.HeroesOfHomeroomC.com. I also have no less than four other projects that I am trying to get to the preview stage so I can pitch them to various publishers. And I'm about to start scripting a one-shot of something special for Action Lab, but I'll let them announce that project when the time is right. Me: What advice would you give to aspiring comic book writers? Ruttgaizer: The single best piece of advice I can give any aspiring writer is to find an artist to turn your words into sequential art. You might have a script on your hands so good it would turn lead into gold but getting an editor to read through that script is like... well... trying to turn lead into gold. Make it as easy for them as possible to see and experience and recognize your talent. If you can hand a submissions editor a copy of a finished comic that you wrote and had someone draw and letter and colour, they can read it the same way they would any other comic. As great as I think my words are, I'd be nowhere if it weren't for the efforts of a handful of talented artists translating those words into images so that I could show them decision-makers like Dave Dwonch. Me: Thank for your time Anthony and best of luck with funding Jake Roth’s second adventure! Do you have a Kickstarter? Want to be interviewed about it and have it showcased on “Kickstart the Week?” Let me know in the comments below or message me on www.comicmaven.com.